Shortly after the release of “Fissures”, we started thinking about doing something new. Inspired by live performances that we had been doing and the desire to find new places to present our music, we decided to branch out and plan an installation-type presentation that could be held in a gallery space. Using everything that we had learned making musical, visual, and conceptual work, we decided to put together a show that would bring all of those elements together at once. We just needed to find a place to present it. As luck would have it, around that same time we learned that proposals were being accepted for Toronto’s Nuit Blanche event for the Fall of 2011. If you aren’t already familiar with it, Nuit Blanche is an all night art event that happens annually in a number of different cities around the world, and Toronto has been hosting an edition since 2006. Over the course of a full evening from dusk until dawn, people wander the city experiencing art in any number of forms. It truly is an incredible night out, and it seemed to us like it would be a perfect place to try something different. And that’s when we came up with the idea for “The Sound is Watching You”, an installation art piece where participant movements were tracked using echolocation technology to create a light, video, and multi-dimensional audio environment for exploration. Using computer vision software, generative sounds, and graphic theory, a visitor could enter into the staging space and create their own artistic experience. Based on this idea we put together a proposal and submitted it for consideration, and were thrilled to find that we were accepted to present the installation in October 2011. What followed was a pretty intense few months of planning, programming, coordination, and trial and error. We had to think of ways to make things work, we had to source materials, we had to consider crowd dynamics, and we had to come up with a musical accompaniment for it all. It was a lot of work and at times it seemed a little bit daunting, but we were up to the task. One of our earliest challenges revolved around how we wanted to represent the audio element of the installation. Up to that point, the music we had made as Kalte had been abstract, ambient, and a little bit scary, but knowing that Nuit Blanche was a family event we wanted to make our sound more accessible to a wider audience. So we started working with a different kind of sound palette that retained some of the Kalte aesthetic but also traveled along a brighter and more inviting path, opting for quirky instead of abstract, and melodic instead of ambient. It was quite a process but in the end we were able to come up with music that remained both true to the Kalte vision and a little more friendly. We were pretty happy with the end result. In keeping with the idea of making what we did more accessible to a different audience, we also decided to take on a new name for this project (and any installation work that we did in the future) so we could distinguish it from what we were doing with Kalte. 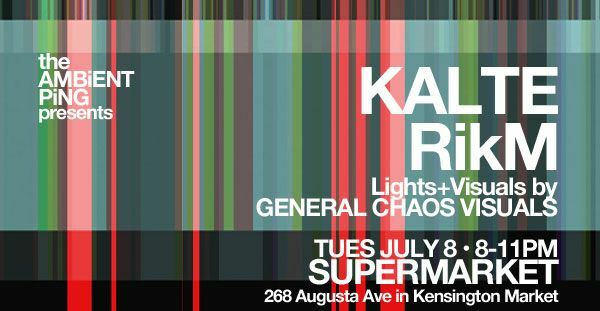 We wanted to give our installation work a name that connected with our musical ideals and concepts while simultaneously setting it apart, and after careful consideration we came up with SubZeroArts, which we thought had an ideological through line with Kalte, but still retained it’s own identity. In addition to working on the technical elements of the installation, we also spent a lot of time considering the theory behind what we wanted to do with SubZeroArts. Much like we had when we were first starting Kalte, we came up with a vision and a vocabulary of sorts that we could apply to this new project, largely based around an idea that we dubbed “You Are Art”. We wanted to make art where participants were actively involved in the creation process. Rather than passively looking at art from a distance, we wanted to add an interactive element where participants could make something happen, which would in turn define their own unique art experience. We felt the idea that “You Are Art” was fully demonstrated in “The Sound is Watching You”. By entering the performance area, each participant would appear as a video projection on a screen at the head of the room, and as they moved they would leave a trail of visual artifacts that would create a pattern on the screen. Walking around the room would also trigger a multi-point sound element providing a soundtrack that would evolve depending on where you found yourself in the room. Ultimately each participant’s movement would result in a unique aural and visual display, thus fulfilling the idea that participants were defining their own art experience. “The Sound is Watching You” made it’s debut at the AWOL Gallery on October 1st 2011, and we’re pleased to say that it was a success in terms of both audience participation and in terms of starting a new stage of our work. 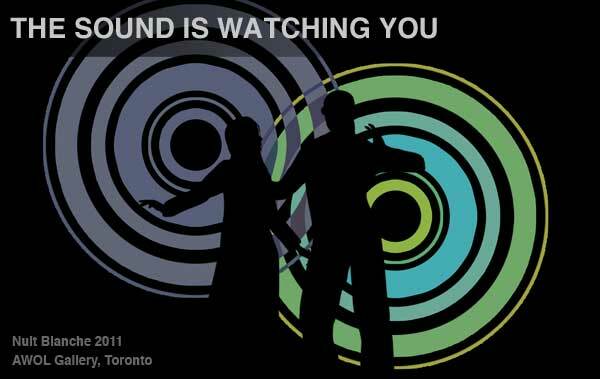 In 2012, we successfully pitched a variation on “The Sound is Watching You” called “LightSoundPlay!” which was staged at SAW Gallery as part of the inaugural Nuit Blanche event in Ottawa, giving us our first out of town performance experience. 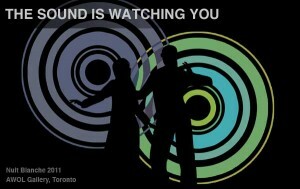 We followed that up in January 2013 with a month long residency of the original “Sound is Watching You” installation at the New Adventures in Sound Arts performance space in Toronto. With these installations we had expanded the scope of what we were doing artistically and SubZeroArts had become it’s own distinct project that allowed us to explore our interests in different directions than we had previously been doing with Kalte. 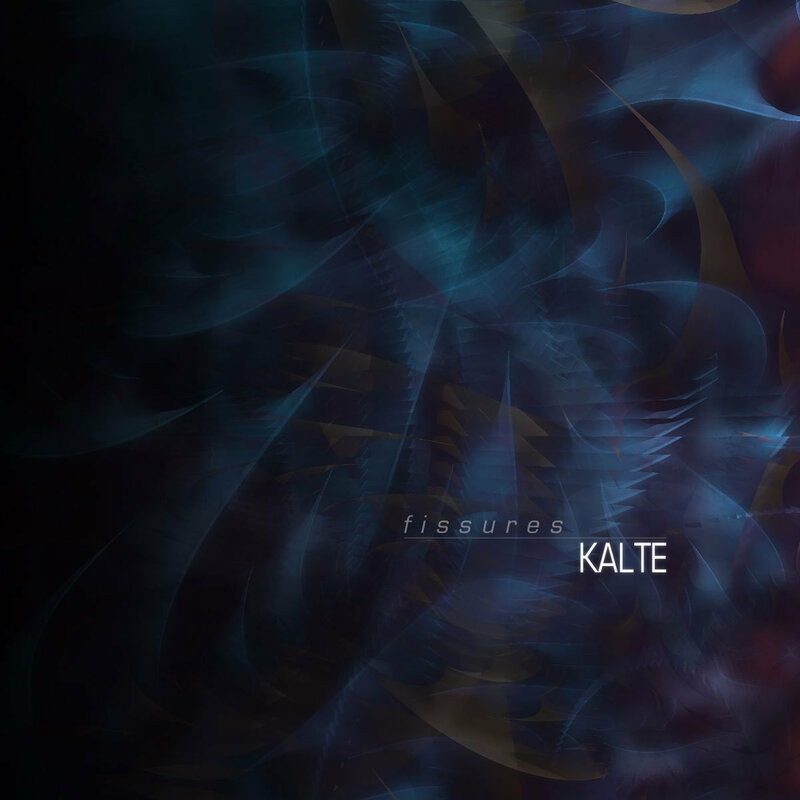 With the release of “Fissures”, we began to think more about the visual ideal of what we were doing with Kalte. There had always been an imagery that we associated with our music, but with our recent live experiences, particularly with Monsters in Your Head, we wanted to go even further and create a more fulsome vision for Kalte. To start with, Deane made a video for “Fissures”, a dark and abstract collection of images that brought to mind the massive pressures and the arctic depths of the Hadopelagic Zone, and that went a long way to inform how listeners pictured the work on the “Fissures” album. By the way, while we’re speaking about our clip from March 2011, we wanted to give a shout out to our friend Liisa who filmed the footage that we used to make that video. In addition to being one of the best writers we know, Liisa is also an awesome video director and we whole-heartedly encourage you to check out her very impressive collection of Goth Style videos. We began working on our third album (with a working title of Kalte 3) in the fall of 2010, and the recording sessions we had for it were definitely influenced by our experiences playing live. We continued to use the mapping technique we had developed for “Glaciations”, and we also broadened our idea of creating a musical space, moving from between the ears of the listener to filling an actual physical environment with sound. It seems like a very simple shift, but in practice we found it to be a significantly different way of thinking that greatly informed what we were doing. In addition to thinking about filling physical spaces with sound, Kalte 3 was also inspired by the weather, being our first release that was actually recorded in the winter. So much of what we had been doing with Kalte drew from ideas of cold Antarctic temperatures and deep undersea pressures, but the truth was that we had recorded both of our first two albums in the heat of the summer, where our only actual connection to cold Antarctic temperatures was the air conditioner at Deane’s place. Actually recording in the winter added a level of verisimilitude to what we were doing that pushed our sound to a new level. Long nights and bitter cold did a lot to influence the sounds that we collected to work with, resulting in some of our most fully realized work to date. Making new music is always a great time, but recording Kalte 3 was particularly enjoyable for us in that we were very comfortable with our vision for Kalte, with our sound aesthetic, and with the processes that we were using. It was a great place for us to be musically, and listening back to what we were doing we can hear that perfect realization of circumstances. We finished recording in mid January of 2011, and decided to name the album “Fissures”, which refers to the lines found in ice or rock as the result of breaking or cracks. It was a simple choice to make as the idea of new forms and patterns revealed in solid objects seemed to run parallel to our discovery of greater depths within our music. 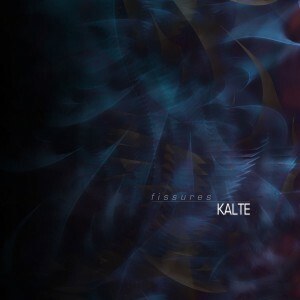 “Fissures” was released in March 2011 on the Petcord net-label with the artwork designed by label owner Synflict. It’s a really beautiful cover that fully captured our vision at the time, and we’re most grateful to Synflict for his support. One of our most favorite shows that we’ve ever played was part of a gallery event curated by our friend David Keyes and the House of Pomegranates, a collection of artists, designers, magicians, alchemists, ne’er do wells, and lovable scoundrels who are among some of the most awesome people we’ve ever met. 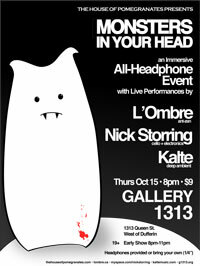 The event was called Scary/Monster/Beautiful, and it ran from October 7-18, 2009 at Gallery 1313 in Toronto. Bringing together art and fashion and music and writing, it was a truly wonderful and magical event, and we were very flattered to have the opportunity to curate a live performance for one of the evenings. Inspired by the nature of the event, we decided that we should do something a little more interesting than just standing in front of a crowd and playing our songs, so we decided to present a headphone concert mostly because we really liked the idea of somebody walking into the space and seeing a bunch of people with headphones on listening very intently to a performance that nobody else could hear. It seemed very much in keeping with the solitary elements of Kalte’s music, and there was a sense of humour to the idea that really appealed to us as well. We billed our evening as “Monsters in Your Head” and invited composer and cellist Nick Storring and L’Ombre to play with us because we really liked their music and we’d never had a chance to play with either of them before. We spent a lot of time trying to source headphones for people to use at the show and figuring out how to make it all work, but in the end it all came together and it was pretty great. As noted above, “Monsters in Your Head” stands as one of the best shows we’ve ever done, and it inspired us to start thinking about new ways that we could present the music that we were doing to new audiences in new spaces. 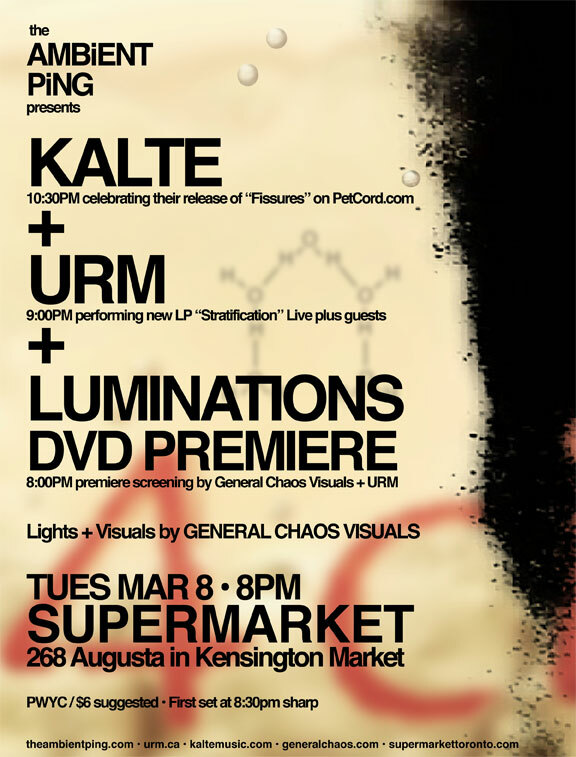 With all of our recent discussion of live shows, it occurs to us that some of you may be interested to see some live footage of Kalte. Admittedly we don’t have much video of us performing, but here’s a clip from a show that we did In March 2011. 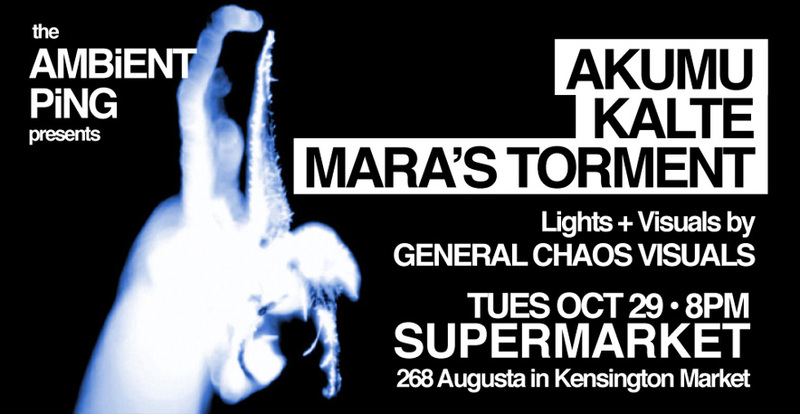 In keeping with the glacial musical themes of our work, we chose to wear parkas for this one. Didn’t we look great? 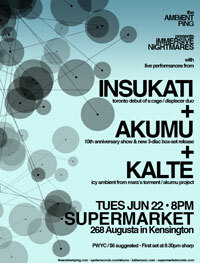 Once we had played our first two shows as Kalte we started doing more shows around Toronto. As stated previously, both of us have always enjoyed playing out so we’re always up for a gig when the opportunity presents itself (in fact we’re playing at Audio Bleed later this month if you’re interested…). Over the years Deane has designed a number of posters and flyers to promote our events, so we thought we would take this opportunity to share some of our favorites. In addition to showcasing some of Deane’s awesome work, we’d also like to take this opportunity to thank all of the awesome artists that we’ve had the opportunity to share a stage with over the years. Playing live is great, but playing live with such talented artists is even better! Did you make it out to any of these shows? Send us an email at info@kaltemusic.com and let us know what you remember about them! Following the release of “Glaciations” we were ready to do some shows, and given that they had been the inspiration for our working together in the first place, it seemed only natural that our first gig should be at The AMBiENT PiNG. 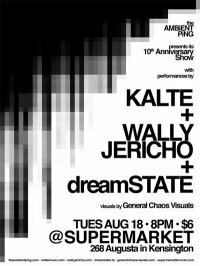 We got in touch with Scott and Jamie about booking something and they offered us a spot as part of their 10th anniversary in August 2009, along with their own project dreamSTATE, and our friend Wally Jericho. Having mapped out what we were doing with “Glaciations” we were ready to play the new material but we hadn’t been using the mapping technique during the recording of “The Lanthanide Series”, so we had to go back and figure out how to play everything from that album in a live setting. It was an interesting process, and required us to take apart the album and study each of its component parts individually, which gave us a new appreciation for what we were doing and some ideas about how we could develop and even further improve upon our processes, which would benefit the recording of our third release “Fissures” (more about that one later). Once we had mapped all of the earlier songs out, we had to come up with a set list of what we wanted to play, and while we had no illusions that we had a beloved back-catalog of hits that we needed to roll out for the fans, we did want to make sure that we touched on highlights from both albums that we thought were relevant in terms of who we are as Kalte, and we also wanted to play some stuff that would sound good live, because you always want to sound good live. We opted to start with “Shallow Approach” because it’s the first song from “The Lanthanide Series”, and it seemed like a nice way to build up a set and create a tone for the performance. From there things started to fall into place nicely and pretty soon we had come up with about 40 minutes covering both albums that was properly mapped and ready for live performance. 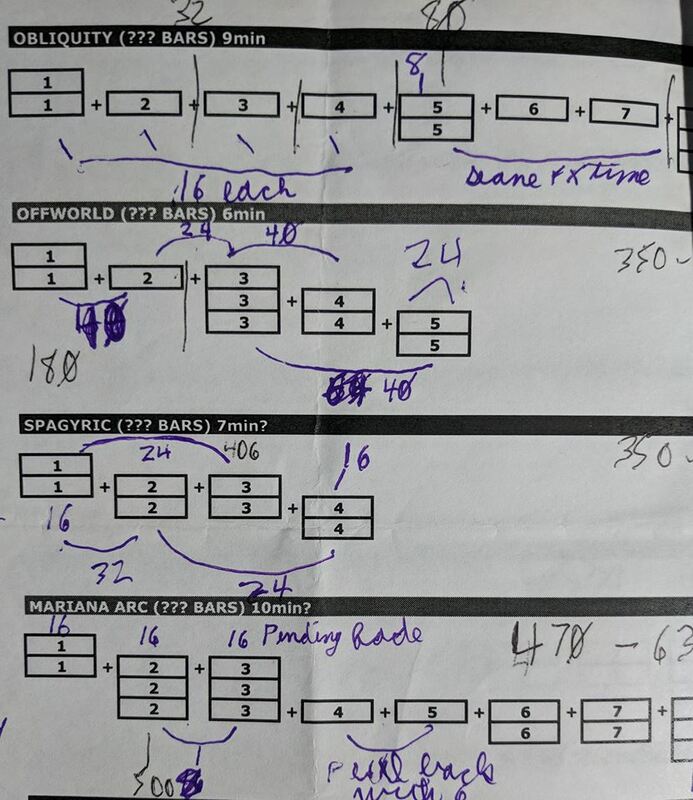 Of course, mapping and choosing a set list, while still an integral part of the live process, is not the only thing you need to get ready for a gig. You also need to rehearse and practice and make sure that you know what to do. You have to identify any cues and you have to know where there are any sweet spots to stay in and any rough spots to be careful with. 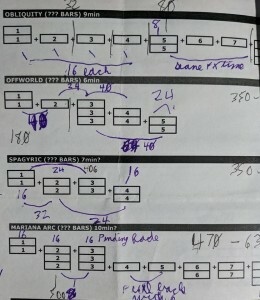 And even though our mapping technique allowed us to recreate our music live, we also had to work in space to be spontaneous and improvise as well, because when you’re feeling in the groove you really want to be able to keep groovin’, right? Ultimately you have to know pretty much everything about your set to get the job done, and that takes a lot of planning out. One decision we made early on was to play a continuous set with no breaks rather than individual songs, as it would create a more consistent mood and it would also save us from any potential disasters as we loaded different songs. Even in those early days we were thinking ahead! We also had to figure out what to wear, and we cannot express how very important wardrobe is when you’re playing live. For the record, at our first show we both went with black jeans, white shirts and black ties. We looked great. To make things even more interesting while we prepared for our first show, we were also offered a gig with the Akin Collective for three days after our spot at The AMBiENT PiNG. Neither of us are the kind of person to turn away an opportunity to play a show, so we said “Of course we’ll do it!” and we set about preparing for a second show while we were getting ready for our first. And you might think that would be easy, we could just play the same set and everything would be fine, right? Not quite. 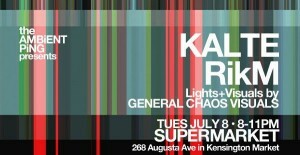 We decided that it would be more fun to come up with a completely new and different set for the second show. And it was fun, but it was also a bit of a scramble too. In the end we were able to get everything done in time for both sets, but we did have to make fast decisions about wardrobe for the second show. We opted for hoodies and sneakers, and we looked great at that show too. You’ll be happy to know that both shows were well received and came off with no technical issues. We played some music, people enjoyed it, and we had fun doing it, which is pretty much the goal for any live show. They were both great experiences that pushed us a little bit further ahead in terms of what we were doing with Kalte, and they inspired us to do more shows in the future. Make your own Kalte Remix! Are you a musician, producer or ambient artist? Would you like to remix, re-envision or re-create some of our material? We thought we’d share a few of our raw samples that we have created over the past 10 years for you to download and have fun with. If you do end up producing some music using our samples — perhaps by writing a new piece or incorporating them into your own material — please post them and let us know because we’d love to hear what you come up with! And don’t forget to tag them with #10yearsofKalte! Having honed and developed a new work flow for recording that presupposed live performances, we found that Kalte 2 came together really quickly for us in comparison to “The Lanthanide Series”. Songs came together faster and we found that the Kalte ideals were becoming more evident, more fully realized. Even the Naming Ritual proved simpler, with a decision about the album’s name made pretty much the day we finished rough mixes. The new songs all had a strong feeling of Arctic cold and the slow growth of glaciers, so it only seemed natural to name it “Glaciations” in keeping with idea of “Glacial” music that we had worked towards while we were recording “The Lanthanide Series”. Once we had a title and some names for songs, we were ready to send “Glaciations” out to see if anybody was interested to release it, and our first choice to send it to was Nathan Larson’s Dark Winter net label. 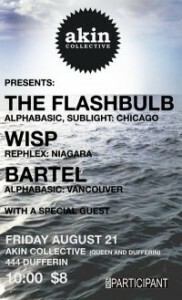 Rik had met Nathan a few years earlier when he made the trip to Toronto to perform as part of a label showcase at The AMBiENT PiNG (see what we mean about them building an artistic community?) and he was really impressed by the artists that Nathan had pulled together. Nathan’s own project Samsa, ANGELswing, and Pholde were all really great projects who’s work resonated with Rik thanks to their shared dark and atmospheric aesthetic. 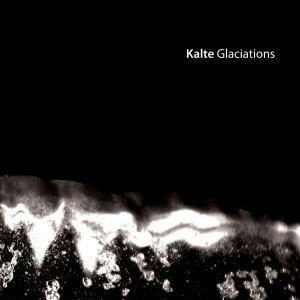 In the intervening time between meeting Nathan and “Glaciations” being recorded, Dark Winter had moved away from being a physical CD label and had set itself up as an online net label, so when we were looking to release “Glaciations” it seemed like a natural fit for Kalte, and we were pleased to find that Nathan thought so too. “Glaciations” was released by Dark Winter on March 31, 2009, and once again we were very flattered to receive positive reviews from a handful of sites. On the Disquiet site, Marc Weidenbaum said “The result is a murky electronica, whose impact is strong even if — or, more to the point, because — the sounds themselves are mysteriously muffled.” Kirill Platonkin wrote on the Agniworld site that “every track has its history and sense background, and listening to the whole album reminds me of solving a riddle with making juxtapositions, uniting various elements into one conceptual system. For me, this investigation was a true pleasure.” Seeing people write things like this about our work has always meant so much to us, and we truly appreciate everybody’s efforts to help spread the word about Kalte. Having found an audience and received some positive feedback from people about “The Lanthanide Series”, we decided to immediately start working on a new album, which was given the very clever working title of “Kalte 2”. We were both really excited by what we had done with our first release and it seemed like a good idea to maintain that excitement by getting back to work, not only to make some more music but also to develop our processes even further. Around this time we also started talking about the idea of doing some live shows as Kalte, which added a new element of excitement to what we were doing, along with some new challenges and technical obstacles that we’d have to overcome. Figuring things out in a closed environment without anybody else around is totally fun, but playing in front of other people is a completely different experience that requires a very different mindset. For the most part in the studio you can easily focus on minutiae and detail and you usually have time to get everything exactly the way that you want it, but in a live setting you’re forced to think about the broader strokes of what you’re doing, and you have to exist in the moment to respond to any concerns or issues that may arise. Live performance can be like tightrope walking at times, but it’s a lot of fun to do and we were both really eager to find a way to play out as Kalte. Among other considerations, one of the challenges we needed to figure out was how to map our what we would be doing live. During the recording of “The Lanthanide Sessions” we used index cards as a system to map out how sounds mingled and meshed with each other and where different actions would occur. The index cards would be laid on a white board and moved around to correspond to changes in the music. It worked well for us when we were in the studio, but playing live didn’t really allow us the opportunity to spread out in the same way. We needed to come up with a way to track the same information in a much more compact and concise way, which led us to develop a progressive mapping system, as seen in the photo at the top of this post. It may not seem like much from a visual standpoint, but in terms of the way that we worked it was a hugely significant leap in our development that allowed us to focus more steadily on what we were doing and easily recreate situations and events. We wouldn’t be amiss in saying that the progressive mapping system was a turning point for us not only in a live setting, but also within the studio. So armed with our new mapping system, we started work on Kalte 2. In keeping with how we did “The Lanthanide Series” we came together with a stack of new sounds to use, and we started to group them in patterns that we thought worked best with each other, making sure to document the process in our maps. And when grouping was done we started to mix and tweak and process everything into the shape that we wanted it to be, and after a couple of months we had a new set of songs that we could recreate in a live setting when we were ready to do so.